America in the 1960s developed an ear for Brazilian bossa nova and the exotic Latin grooves of boogaloo thanks to hits by Joe Cuba, Ray Barretto, Mongo Santamaria, and Stan Getz. It was American jazz saxophonist Getz who popularized the compositions of Antonio Carlos Jobim with collaborative recordings of "Desafinado" and "The Girl from Ipanema," thereby setting the table for the late sixties success of pianist Sergio Mendes, a Jobim protege. 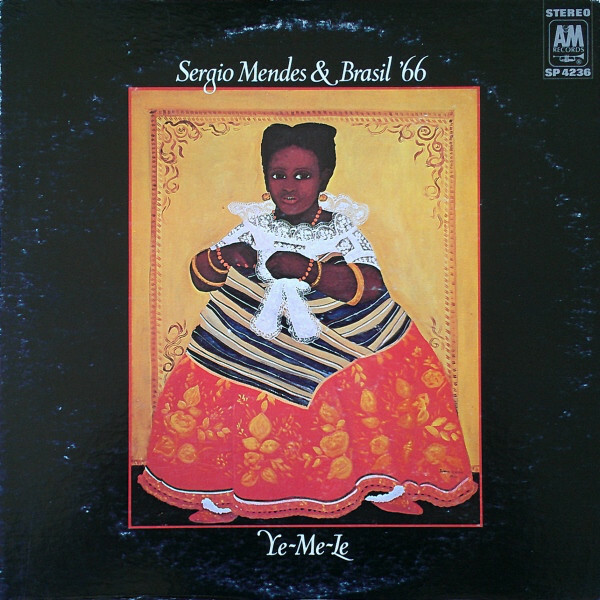 Having released a number of poorly-selling jazz albums for Atlantic, Mendes organized a group with two American female vocalists and an evenly split English-Portuguese repertoire, resulting in the platinum album Herb Alpert Presents Sergio Mendes and Brasil '66 (1966) for Alpert's A&M label. Even so, Top 40 success remained elusive until 1968, when the group would perform "The Look of Love" (which Dusty Springfield had recently recorded for the Casino Royale soundtrack) at the Academy Awards, thereby sending it to #4 on Billboard. 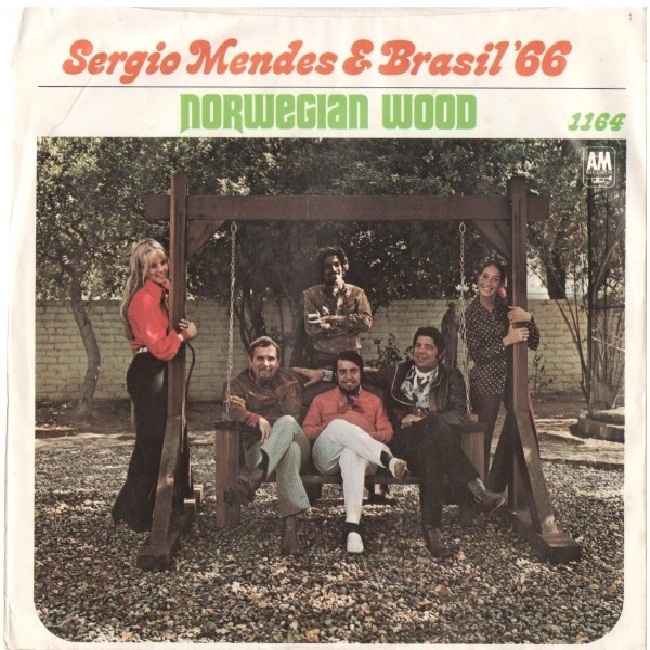 The pop chart path of Sergio Mendes and Brasil '66 in the early seventies, though, follows a downward arc, with all nine singles released between their peak year of 1968 and 1973 charting at progressively lower positions, seeming to reflect the parallel waxing and waning of the bossa nova and boogaloo fads. They'd vanish from the singles charts altogether in 1973 until Sergio Mendes's 1983 resurgence as a wedding ballad VIP with his "Never Gonna Let You Go." 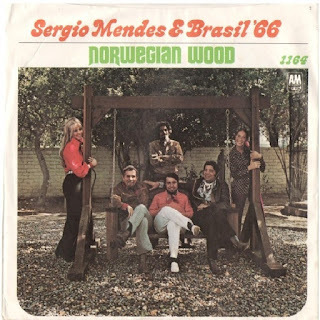 "Norwegian Wood" was the fourth and final Sergio Mendes & Brasil '66 Beatle cover, all of them worthwhile. (The other three: "Day Tripper," "The Fool on the Hill," and "With a Little Help from My Friends.") The arrangement accentuates the story's slow attraction > quick consummation > flight trajectory. As the music chugs along on its main two-chord rotation, you can hear Mendes (or someone) go "hyah!" four different times, as though playing the role of singer Lani Hall's lover, escaping on a horse. The Ye-Me-Le album this song comes from (those are chant words from the title track) featured a painting on the cover by Brazilian folk painter Ivan Moraes. The other single to be released from it, Jimmy Webb's "Wichita Lineman," had topped out at #95 in late 1969. The B side's "Masquerade" sounds like the work of veteran craftsmen, which makes the apparent absence of any meaningful info about its composers—Leonard Haynes, Jr. and Ron Rose—hard to swallow. 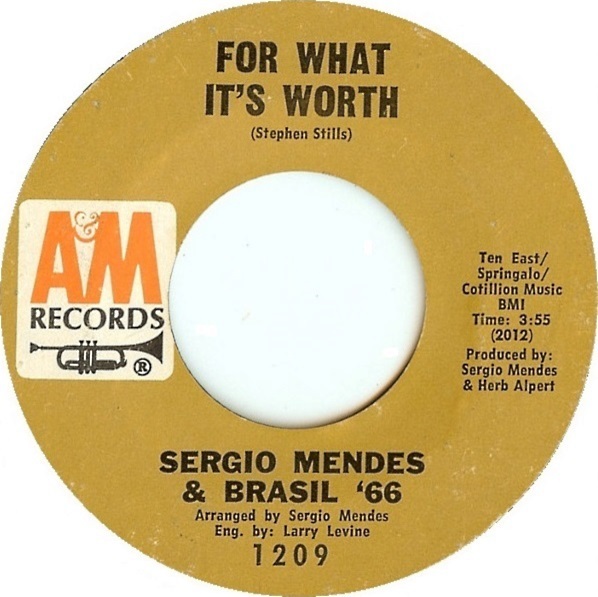 Stillness was the album Sergio Mendes & Brasil '66 were readying at the time they released their "For What It's Worth" single. It would be their last album before a label switch and a reboot as Sergio Mendes & Brasil '77. Halfway through the album's production, singer Lani Hall left the band to marry A&M label head and Mendes mentor Herb Alpert, leading to speculation that the group's subsequent collapse had to do with surrounding tensions. (The other female singer had been American actress Karen Philipp, who had appeared as "Nurse Dish" on a few M*A*S*H episodes.) The group's sultry cover version of Buffalo Springfield's 1967 protest anthem emphasized the song's "Stop!" motif, possibly in observance of the forthcoming album's "Stillness" title. "Viramundo" (turn around) from side B is an interpretation of a song that had appeared on the 1967 debut album of Brazilian force of nature Gilberto Gil. Side A: "For What It's Worth"
Written by Joni Mitchell and given a minor hit rendering in 1969 by Judy Collins, Sergio Mendes's recording of "Chelsea Morning" seemed to take its cues, in terms tempo and rhythms, from a version by Green Lyte Sunday, swapping their violins for congas. (The Dayton, Ohio group rose to #19 with it on the easy listening chart in the summer of 1970; the Stillness album and "Chelsea Morning" single appeared in November.) The other side contained an English version of a song (originally "De Onde Vens") by Dori Caymmi, the son of well-known Brazilian folk singer Dorival Caymmi. Its pensive manner, winding melody, jarring orchestration, and flat lead vocals by Mendes make for a difficult listen. 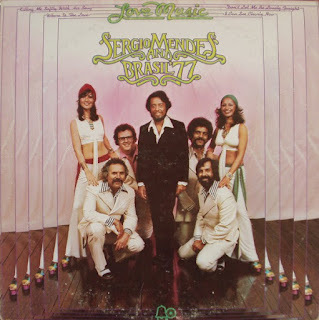 After "Chelsea Morning" ran its course on the easy listening singles chart, Sergio Mendes and Brasil '66 never again appeared under that name or as A&M Records artists. 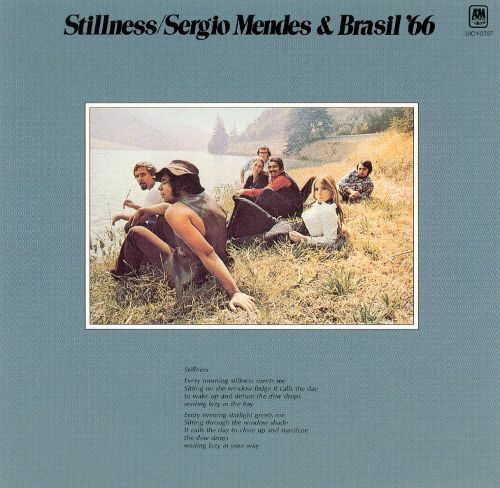 Side B: "Where Are You Coming From"
The revamped Sergio Mendes and Brasil '77 included Mendes's wife Gracinha Leporace, among other changes in personnel. The switch to a new label (Bell) suggested further that the loss of previous vocalist Lani Hall, who had quit to marry A&M label head Herb Alpert and to launch a solo career, did not necessarily happen amicably. The Potter and Lambert-penned "Love Music," a track from the Four Tops' 1972 Keeper of the Castle album, merged the Mendes sound with the Philly Soul-conscious string and horn arrangements of saxophonist Tom Scott. "Walk the Way You Talk" on side B is a Bacharach-David song introduced by Dionne Warwick in 1970; the Mendes version, with its Cuban piano, is the livelier of the two. 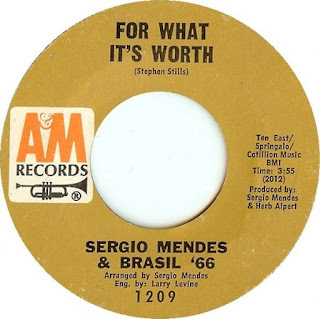 Side B: "Walk the Way You Talk"
Here was the final charting single for any of Sergio Mendes's "Brasil" outfits, a polite sashay through Roberta Flack and Donny Hathaway's crossover smash from 1972, arranged by Bob Alcivar. An even more polite treatment of Brazilian songwriter Nelson Angelo's "Hey Look at the Sun," sung by Bonnie Bowden, appears on the flipside. 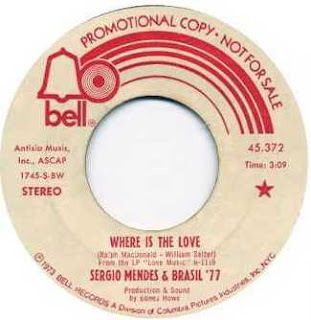 Exactly ten years after this single, Mendes would bounce back in 1983 with the decidedly non-bossa nova Top 5 hit "Never Gonna Let You Go." Side A: "Where Is the Love"
Side B: "Hey Look at the Sun"